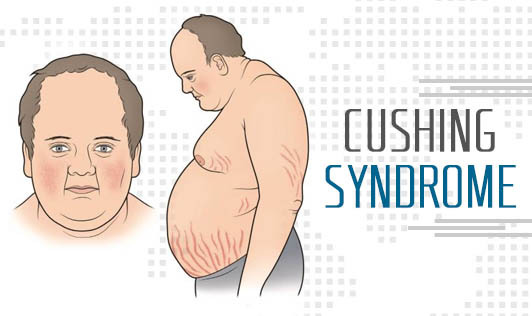 Cushing syndrome occurs when one's body is exposed to high levels of the hormone cortisol for a long period of time. The most common cause of this condition is due to the use of oral corticosteroid medication which is sometimes called hypercortisolism. Too much cortisol can produce some of the hallmark signs of Cushing syndrome - a fatty hump between your shoulders, a rounded face, and pink or purple stretch marks on the skin. This condition can also result in high blood pressure, bone loss and, on occasion, diabetes. Women with Cushing syndrome may experience thicker or more visible body and facial hair and irregular or absent menstrual periods. Men, on the other hand, may experience decreased libido, decreased fertility and erectile dysfunction. The recovery period from Cushing syndrome usually depends on the severity and the cause of the condition. Contact your doctor if you're taking corticosteroid medications to treat conditions such as asthma or arthritis or if you experience any signs or symptoms of Cushing syndrome!